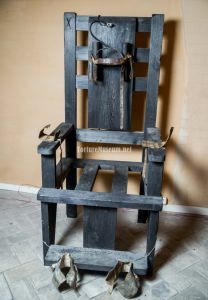 The electric chair was invented in America in the XIX century. 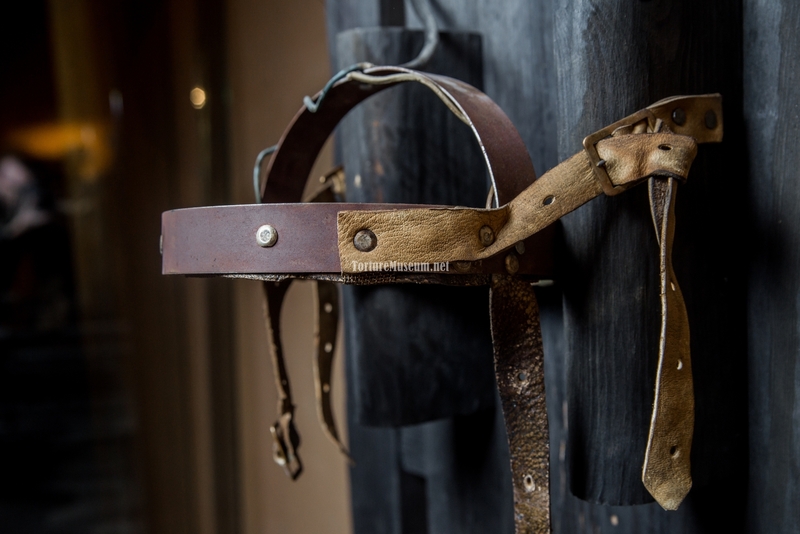 The prerequisites for this device were both scientific progress and the struggle to make the death penalty more humane. For the first time, the idea of reforming penal practices took place under the supervision of dentist Albert Southwick, and he shared said idea with the authorities. Harold Brown and Fred Paterson, intrigued by the idea, were instructed to conduct relevant research. Experiments killing animals with an AC current were successful, and scientists announced the feasibility of its implementation in punishing of criminal. Thus, in 1889, a law was passed concerning the legitimacy of the electric chair. A model was then constructed by a talented prison electrician named Edwin Davis. 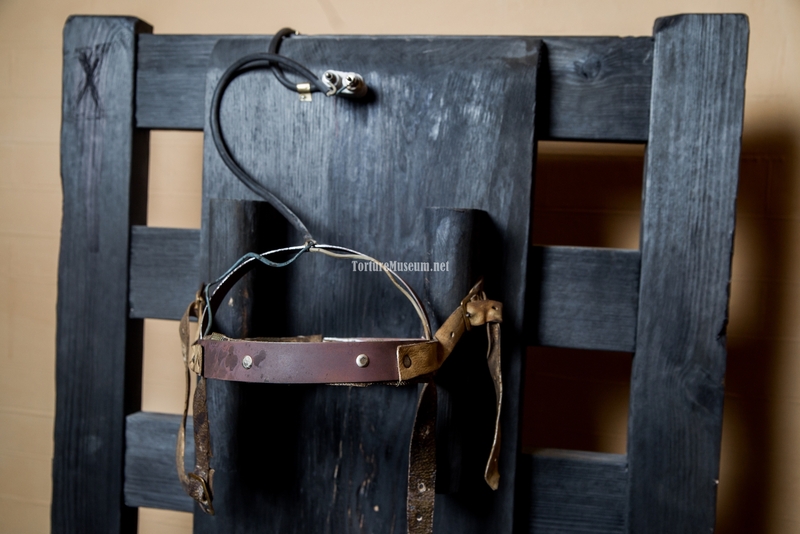 The punishment device involves a seat of conductive material and helmet equipped with straps to secure its fit. The prisoner’s head is shaved and tied to the chair with brine-soaked straps, his eyes sealed with tape or covered with a bag. Then a current 2700 V current is discharge through his body, twice. Although scientists say that the destruction of the central nervous system is faster than the time it takes for the brain to register the impulses of pain, it can hardly be considered a humane spectacle. The execution is often accompanied by spontaneous bowel movements and vomiting, thus the room fills with the smell of burnt flesh, human waste, and smoke. The prisoner’s body temperature sky-rockets. Sometimes the eyes can’t withstand such stress and they pop from their sockets. Their facial features contort in horrific pain. If death doesn’t occur, the electrical must be pushed beyond their limits, while the man’s blood and organs literally boil inside his own body. 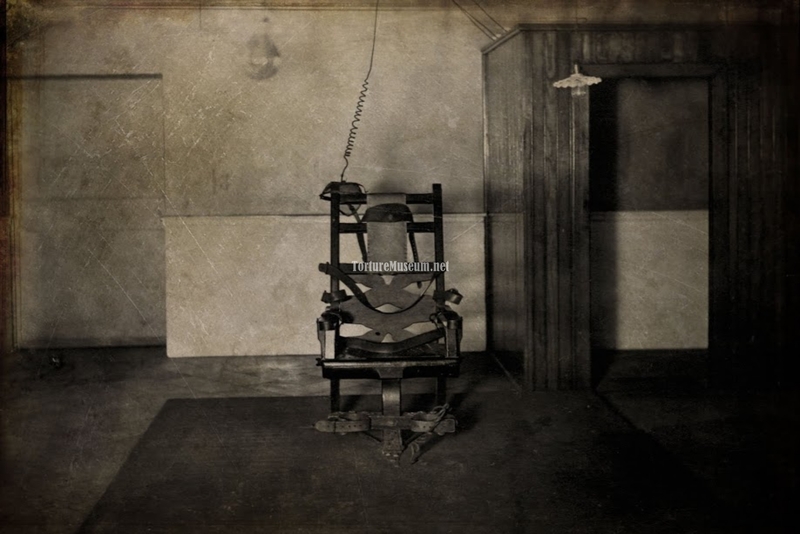 The first dead-man sentenced death via the electric chair was William Kemmler in 1890. The event resonated greatly within society, and soon this new method was being employed often in place of hanging. Currently, the chair is used in seven States, along with lethal injection. Throughout the history of the electric more than 4300 people have been executed by its means. An interesting fact: This particular sentence is often performed by several executioners. They press switches in synch (the fully-equipped chair having only one switch), and thus, these masters did not know which of them had actually killed the man. A similar procedure exists for the firing line, in order to reduce the amount of guilt and responsibility that is felt in connection with the prisoner’s death. One of the latest victims of this torture was Robert Gleason (2013) – the prisoner killed two inmates so that his dreams of being sentenced to electrocution could be fulfilled. Would the people of our antiquity be able to imagine that one day humanity would harness the power of lightning? A legendary power, lightning is neither good nor evil. With its aid one can light their way through darkness, and kill people. In the middle of the room sits a wooden chair to which sinister cords have been drawn. The offender, having committed a cruel and cynical murder, is now being acquainted with the place. His doomed visage lights up with carnal fear as soon as he lays eyes on the electric chair. He attempts to backstep, but the strong arms of the executioners force him to sit down, and they strap in his hands. A sponge soaked in brine is attached to his forehead, followed by the metal plate of the electrode. While the judge reads aloud the sentence, an additional electrode is being secured to the man’s left leg. After all this, invisible hands pull down the hand-lever. The body of the man soon to die jolts from the first shock. An electric current passes through him entirely, but doesn’t end him. It merely distributes the pain. The unusual nature of his muscle spasms ignites a primitive panic within him. Crooked fingers dig into the wooden armrests, bare heels are peeled till bloodied upon the rough cement floor. The executioner switches off the current, although the prisoner is still alive. He shakes his head back and forth, his entire being in protest of the inevitable, the epilogue. The voltage is increased, and the current is resumed once more. The body lets out a hoarse growl as it is stressed to its limit. The electrode on the dead-man’s head begin to smoke, and a pink foam oozes over his lips. The body loses control of its bowels, and a mess of fetid droplets of feces splash down into a bowl through a specifically placed hole in the seat of the chair. The eyes roll back in the their head, the body shivers its final, powerful convulsion, and the body goes limp. On a side note, do you remember how in Greek legends Zeus would throw uncontrolled lightning down from the heavens? His job has now been taken over by the electric chair.